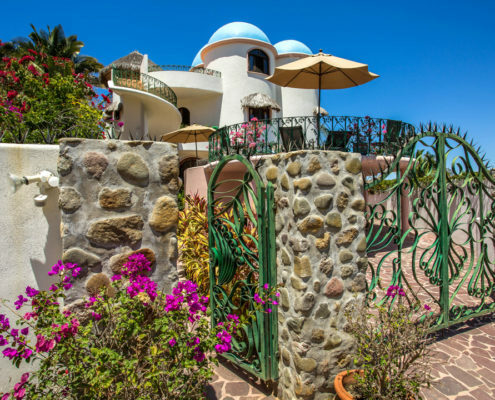 Villa Poema de Amor is visible from anywhere on Sayulita Bay and perfectly located. Perched on the south end of the bay, directly above Villa Amor, Villa Poema de Amor features stunning 360-degree views of tranquil Playa los Muertos, Sayulita, and ocean as far as the eye can see. Watch the surfers ride waves from your windows and the fishermen coming into shore with their daily catch. The romantic and simple lines of this Villa will delight your senses and transfer you to that place that vacationing is all about: freedom to play, dream and forget about the responsibilities of life. This is the perfect place for writers, lovers, families, newlyweds, friends, or just quiet time by the sea. Refresh, renew, relax, and be inspired by the breath-taking views. 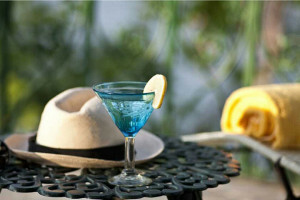 Swim in the infinity pool overlooking the ocean or lounge on one of the many private terraces, listening to the wind through the palms and basking in the golden sunlight. The owner wanting to reflect the romance of this exquisite location overlooking the sea, named the villa Poema de Amor after her two passions…love and poetry. Each of the individual casas were then named after poets: First floor, Casa Hafiz (Persian poet Hafiz) & Casa Lorca (Spanish poet Fredrico Garcia Lorca); second floor, Casa Neruda (Chilean poet, Pablo Neruda); and third floor, Casa Rumi (world’s most revered love poet, Persian poet, Rumi). Designed by architect Miquel Valverdez and built by Arturo Fernandez, this Villa is one of the most unique villas in town.